Monkeying Around – Welcome to InflatedStory.com! Did you know a volcano can be invisible from 18.6 miles away? The haze at that distance can make it disappear. Even worse, the atmosphere around an active volcano can make it awfully popular with the clouds. That is to say, I was excited about photographing balloon monkeys in Ecuador, but by the third day of driving around with balloon monkeys I was beginning to get worried. 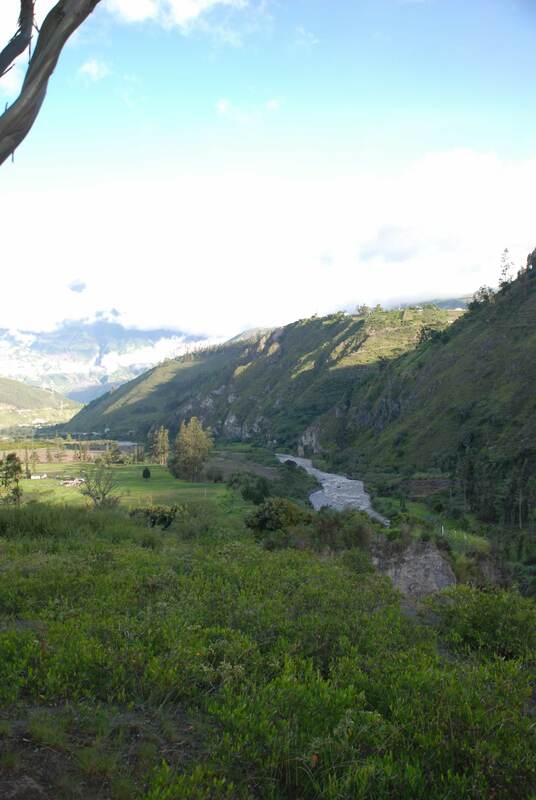 The 18.6 miles to Tungurahua seemed further every day. Tungurahua faded by clouds, light, and distance. Our monkey friend we passed each afternoon. I photographed the balloon monkeys during a mission trip to Camp Chacauco in Patate, Ecuador in 2008. It was one of several trips I took to Ecuador with older youth from First Baptist Church of Atlanta, TX. If you have been on a mission trip, you will appreciate the grueling schedule and the need to prioritize the work we came for over photographing balloon sculptures. Nevertheless, by the end of the first full day, I had managed to create monkey one and after a day or two lamenting the hidden volcano I added a second monkey. Through the week our team left camp each day to travel to a ministry site 20 minutes further along the valley. Each day we passed a house with a pet monkey. You guessed it! I asked our native translator about the monkey and was able to get balloon photos with it. It’s a little known fact that monkeys are afraid of balloon monkeys. At least, this one was. He liked people, but when the balloon came near the tree, the monkey quickly climbed away. For what it’s worth, the monkey posed more easily than the eagle did. Still though, great shots of the volcano were elusive. Three of the fantastic students I had the opportunity to lead to Ecuador. Only one book sculpture was impromptu. During a few hours of afternoon free time in Ecuador I considered, “What else could I make that fits in Ecuador for the book?” That’s when I went through my balloons and made a last-minute Toucan. With a group of FBC youth in tow, we hiked to the opposite side of camp from the volcano and went to work photographing the toucan. Gratefully the clouds were not an issue when a Volcano was not needed. Only on our last full day at the camp did God finally part the clouds. The scattering began while we were on our ministry site playing with children from an Ecuadorian school and later painting. The photos were tricky to take over the edge of the school fence, but with the help of the students, we got started photographing. They were not great shots. During our final afternoon free time, we kept an eye out for changes, and that’s when we were really blessed. Finally, the clouds cleared! With our fresh view of the volcano I grabbed a few friends and made our way to a tree on the edge of camp facing the volcano. I knew we had a good chance to capture the gorgeous valley, the flowing river, and the billowing volcano, but it was a delightful surprise when a hint of a rainbow formed in front of the volcano. 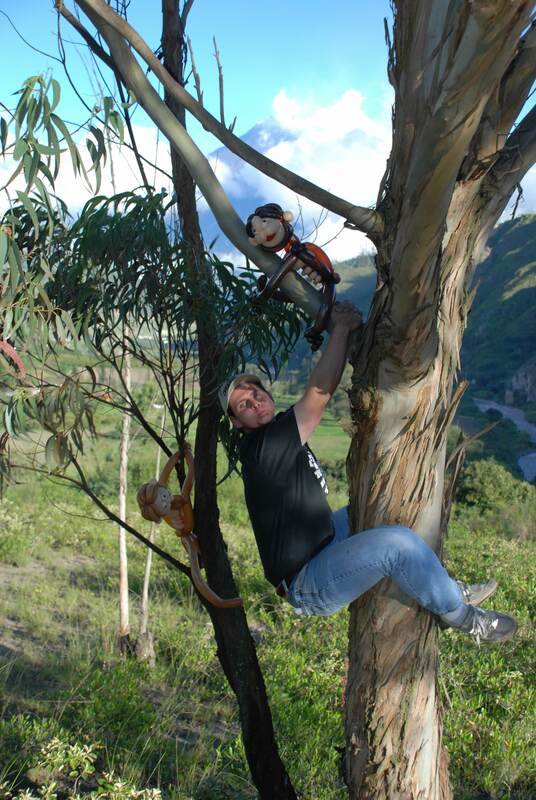 Even though it was one of the first pictures I posed for the book, I still consider the shot of balloon monkeys in a tree with a river flowing through a beautiful valley and an active volcano with a rainbow in front of it one of my favorites.